There was a time when Misaka Mikoto believed that her developing gift of electromancy, the ability to generate and freely control the flow of electricity, could change the lives of thousands of paralyzed patients worldwide. Now, she has already come to understand that the people surrounding her had always cared more for power than anyone's well-being. However, she is not the type to let disappointment get her down. If the world she lives in is filled with betrayal and hardship, she must simply overcome them and become stronger in the process. 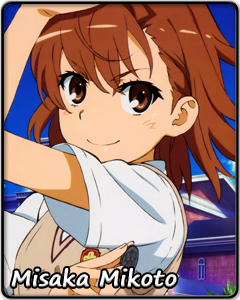 Mikoto moves forward, proudly, and eventually becomes one of the world's most powerful ability users, receiving the name 'Railgun'. Fame is not what Mikoto seeks, though. She sees others as her equals, regardless of their strength or social position. What she wants is a way for her to fight against the cruelty around her. She walks the streets alone at night, luring out thugs hoping for easy prey. Although the troublemakers are sure to remember their encounter with this particular 'defenseless girl', Mikoto herself realizes it will be almost impossible for her to make a difference this way. Nevertheless, even her struggle with the shadows of Academy City can do nothing to stain her innocent heart. While Mikoto readily risks her own safety and life for the sake of others, she feels most at ease in more mundane situations: playing with children or having fun with her friends. No matter how hard she tries to hide it, she has a childish and carefree side at odds with how dependable she wants to appear. Mikoto's life is a story of a young girl faced with tough choices which could affect the lives of many. But if it is her we have to rely on, it will all turn out all right in the end.